Monsieur has invented le best sport ever! You are doing sports now? I am. Avec Monsieur. We do sports together. That’s wonderful! I’m so glad you have something to share. Is this a game that involves your blue rubber ball? Non, c’est un Extreme Sport. Is it with the feather toy? The feather toy, pah! She is for girlie cats like Mia. Does this involve destruction? Like when you shred a roll of toilet paper? Non, ça, that is for kittens. Well, you certainly did your fair share of that when you were a kitten. So I give up. What is this sport? It is the chasing of a wild et elusive prey. You are chasing prey? Here in the house? Oui!!! I lunge, I chase, I leap, I pounce! Ahhhh, wait a minute. This prey, would it be red? The laser pointer. I should have guessed. I’m so glad that you and Monsieur have discovered this sport. Monsieur exerts un control étrange on cette red dot. It comes from his hand and flies around the room! Just please don’t knock over any lamps while you fly around the room after it. I don’t want wanton destruction to be the subject of a future blog post. 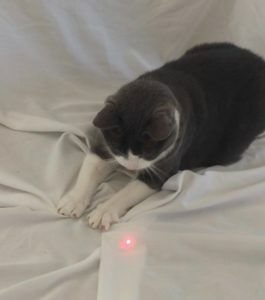 Hahahahaha, a red laser dot! What a great idea to exercise one’s pet. Love it! WE AGREE! The Red Dot is the best toy (we mean PREY) ever invented, and we all love playing with it!